At Majdal Shams in the Golan Heights, hundreds of 'Palestinians' from 'refugee camps' in Syria crossed the border into Israel. Tens have been injured in firefights with the IDF and there are apparently some (at least one) dead. The area is a closed military zone, and Magen David Adom has announced a multi-casualty incident. In Lebanon, the Lebanese Armed Forces shot in the air to stop 'Palestinian refugees' from crossing into Israel from a rally across the border from Avivim in Ras Amoun. 'Palestinians' claim 45 people where hurt in a march to the Erez crossing point between Gaza and Israel (which has been closed for months). A couple of lesser incidents in and around Jerusalem. Israel Radio is interviewing an Arab reporter who says over 1,000 people crossed the border from Syria into Israel. The IDF is firing on them. The reporter claims that the infiltrators have not fired back, although we have already heard otherwise. Israel Radio reports injuries on both sides of the border and multiple dead. Even police and Magen David Adom ambulances are not allowed into the area without IDF permission. It's a closed military (battle) zone. There are people dead on both sides of the border. There are tens of ambulances in the area. Israel Radio also has its (Jewish) Arab affairs correspondent in Majdal Shams, who says that there are 'Palestinian' flags and pro-'Palestinian' demonstrations in Majdal Shams. He's also reporting multiple dead and says that the Druze residents of Majdal Shams are in shock. Local resident asks the reporter where the police and the army are. Local residents confirm the infiltrators are 'Palestinian refugees' from Syria. No Druze from Syria crossed the border. Israel Radio's Arab affairs correspondent interviews some of the infiltrators. They say there are 3,000 of them who have crossed into Israel. They're from 'Palestinian refugee camps' in Syria. They're trying to rise up the residents of Majdal Shams. They are exhausted - apparently they walked all the way there from the Damascus area which is 40-50 miles away. The IDF and the police are nowhere to be seen. Our 'intelligence' services apparently decided that the Syrian army would not let these people approach and cross the border, but the Syrian army was apparently happy for the distraction from what's been going on in Syria. Most of the Syrian wounded are still on the Syrian side of the fence. The one dead Syrian ('Palestinian') is on the Israeli side. Three Israelis have also been wounded - no word if they are IDF or civilians. Carmlea Menashe, Israel Radio's military correspondent, reports that infiltrators include human shields (children and the elderly). IDF Spokesman has thus far had no comment. Al-Jazeera reports hundreds in Ras Maroun in Lebanon and that IDF has moved two tanks close to the border. 'Hundreds' of 'Palestinians' now demonstrating in 'Tahrir Square' in Majdal Shams. 'Palestinians' from Syria say they no longer fear Israel. I hope that the IDF has at least secured the border with Lebanon. 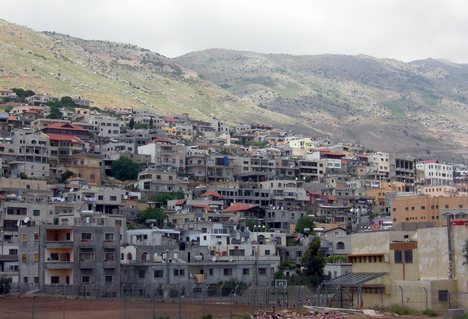 There is no real connection between the 'Palestinians' from Syria and the Druze of Majdal Shams. The only connection between them is an attachment to Syria. Arab affairs correspondent Yoni Ben Menachem says that no one knows how this happened. But the Syrians clearly allowed this (after 40 years of quiet) in a bid to distract attention from what's going on in Syria itself. IDF is reacting defensively. They're not expected to cross the border into Syria. Al-Jazeera reporting (according to Israel Radio) said that all morning al-Jazeera was reporting about the Syrian uprising and now that's been pushed to the side by this story. Israel Radio correspondent in Arabic Muneed Fares says four Syrians have been killed. Ambulances trying to reach Wadi where action taking place, but IDF not letting them through nor are they letting more 'Palestinians' through who are trying to reach Majdal Shams. IDF says it will not under any circumstances allow 'Palestinian' demonstrations (which are all over the place) to cross the green line (1949 armistice line). Tanks fired on 'Palestinians' attempting to infiltrate the Erez crossing. There are also demonstrations around Jerusalem and in Hebron. One dead and 10-15 wounded when IDF fired on demonstrators who tried to cross the border from Lebanon into Israel in the area of Ras Amoun. IDF fired from within Israel. IDF shooting also at the Erez crossing from Gaza and there are 'tens' of wounded (50-60) according to 'Palestinian' sources. Two dead and 15 wounded in Ras Amoun. By the way, this is from Arab sources according to Israel Radio - IDF has not confirmed that it opened fire. Syrian border incident was particularly unexpected. IDF preparing for this for months. Not good. IDF spokesman confirms that there is an 'event' in Avivim (the border with Ras Amoun). Hundreds of people reached the border fence and Lebanese Armed Forces could not stop them. IDF opened fire. There are injuries - we don't know how many yet. IDF spokesman says a few thousand reached the Syrian border fence and destroyed the fence. They are now in Majdal Shams. Here also IDF opened fire and is aware of wounded - maybe some tens. Don't know yet how many killed. IDF forces still preventing hundreds more from entering. A number of commanders in Golan were lightly wounded and still in the area and fighting. Israel Police in the area now along with the IDF according to IDF spokesman. IDF forces are along the fence and preventing people from entering Israel. How did this happen? IDF spokesman says it's too soon to say. Officially four dead and 15 wounded on Lebanese border. IDF allowing 'Palestinian' demonstration in Majdal Shams to continue. They are carrying names of 'refugee camps' in Syria. No wounded have reached Israeli hospitals yet. Israeli residents of northern border areas asked to stay in their homes with their children. IDF accuses Iran of being behind what's going on in the north. Security forces accuse Syrian army of allowing 'Palestinians' to reach the border. 50 'Palestinians' wounded at Erez on Gaza and 20 in Kalandia on the outskirts of Jerusalem. Man killed earlier in Tel Aviv a 29-year old from Givatayim. Here's some video from al-Jazeera Arabic. The left side looks like the Lebanese border - I can't tell you what the right side is. Stupid Jews. We should be giving the Arabs the Naqba they never had. Totally, Shy Guy!! They should mine the borders; that way no Israelis get hurt! Unbelievable!! Is there any reason that should not be done? Why are we not allowed to defend like we really mean it? Are a certain amount of us expendable? The Arabs would love to give the Jews another Nakba! Isn't any one in Israel taking it seriously? Why are we not allowed to defend to defend like we really mean it? Mining the borders is an idea that could have prevented loss of a life and prevented our energies from being thinned. Are we being seen as expendable? Does anyone here understand what is happening to the government's desire to protect the people?